Minami Daito Airport was built as a Naval airport by the imperial Japanese Army in September 1934. The runway was repaired in June 1963 and expanded to 1,200m in December 1968 in order to accommodate YS11 aircraft. The approach-way did not conform to the Aviation law, which applied to Okinawa from 1972 when Okinawa reverted to Japanese Administration, so it was treated as if it were shorter than its actual size. 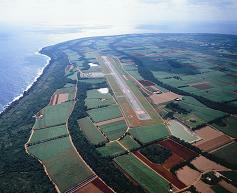 Construction of an 800m runway was in service completed in August, 1974. DHC-6 aircraft flew between Naha and Minami Daito by then, although they were frequently cancelled due to frequent bad weather and wind conditions. The airport was consequently moved and upgraded to accommodate larger flights in July 1997. 1997/ 7/20 Commercial services of Minamidaito Airport were discontinued.